Warm potato salad made with ramps (or wild leeks) and potatoes grilled in a foil packet right on the grill. They’re tossed with mustard and maple dressing to make an easy vegan and gluten-free side dish for a barbecue or potluck. Along with fiddlehead ferns and asparagus, ramps (or wild leeks) are the first real green crop we see here in the spring in Vermont. While I am watching my food blogging friends all over the country get excited about strawberries, here in Vermont, after months and months of snow and ice followed by stick season I’m just glad to be having warmer temps and see the landscape turn lush and green again. Strawberries are still ohhh, a month away. So for now, we are getting excited about the wild harvested leeks from our muddy creek banks of the rivers flowing out of the Green Mountains. Really, that’s where they come from. Pretty glamorous no? In fact the river that runs through the valley here in my little town is called the Winooski which is a Native American word for wild onion. Cool huh? Ramps are very tender and they look sort of like a scallion with big flat greens. They are great cut up and sauteed. Just use them like you would leeks or onions, though they require shorter cooking times. I love them in scrambled eggs with fresh goat cheese. Or on top of pizza with sausage and mushrooms. Since May is NATIONAL SALAD MONTH, and this is a seasonal blog, I wanted to come up with a salad with ramps in it. Duh! Like I even had a choice in the matter? First I thought about doing a variation of this creamy yogurt dressing. Like a ramp ranch or something like that. But then I couldn’t stop thinking about getting the ramps on the grill. I’m kinda obsessed with grilling right now. As I am sure you are too. And we are getting a few pounds of potatoes a week from our CSA. So I decided to make a potato salad on the grill. Instead of boiling the potatoes or steaming them, I let the grill do the work. I made two packets of potatoes (like I did here) and then just turned them and rotated them occasionally. Next I made a sweet mustard dressing with maple syrup from our 2014 backyard sugaring maple crop. I chopped up the grilled ramps and tossed them in. 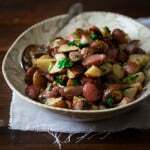 This potato salad will be great all summer long for a side dish for barbecues and potlucks, just sub in scallions for the ramps. I tried it and it worked perfectly well. And I wanted to let you know that we had some of this potato salad as left overs out of the fridge, ie cold. And it was just as yummy. So if you want to make this ahead go for it. 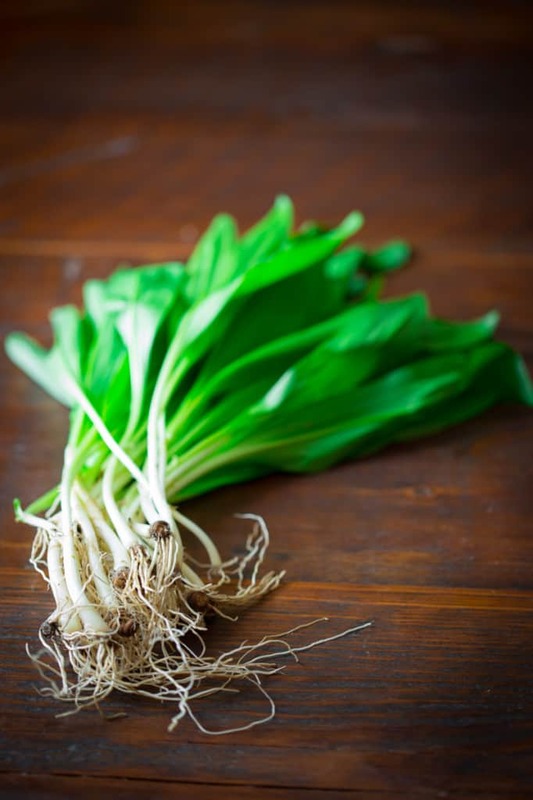 Have you ever tried ramps? What have you been grilling lately? 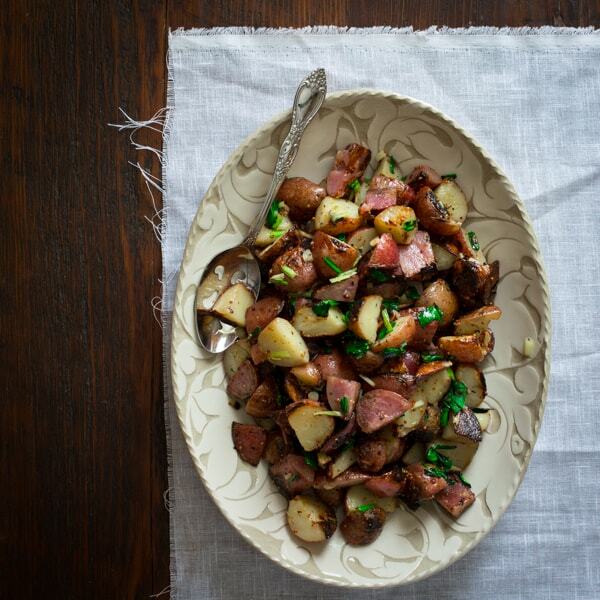 Warm grilled potato salad with ramps with maple mustard dressing. If you can’t find ramps use scallions. They work perfectly. 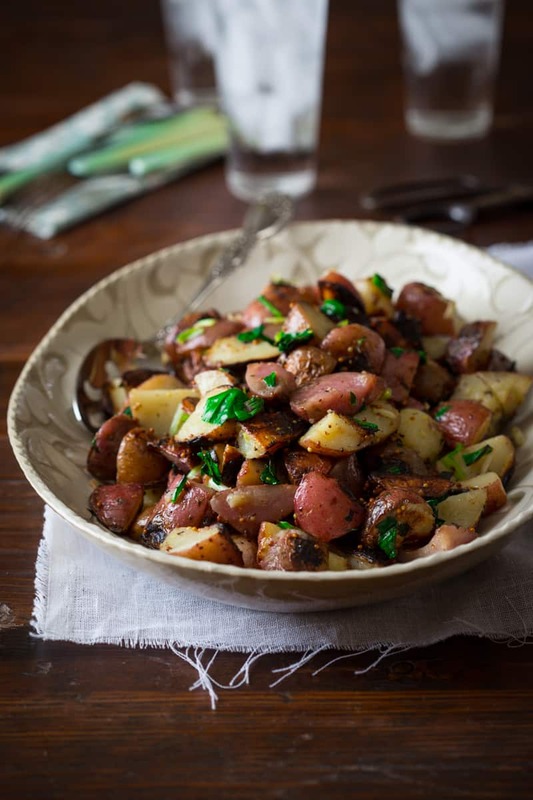 Toss potatoes, 2 teaspoons oil and ¼ teaspoon salt in a large bowl. Cut four two feet long sheets of foil. Spread two out on work surface forming a double layer of foil. Coat foil with cooking spray. Spread half of the potatoes out on one side of the foil. Fold and seal the foil into a packet about 8 by 10-inches big. Repeat with the other double layer of foil, cooking spray and the remaining potatoes. Place packets on grill and cook until the potatoes are tender, turning and rotating packets occasionally, 35 to 45 minutes total. Meanwhile, whisk 4 teaspoons oil, the remaining ¼ teaspoon salt, vinegar, maple syrup, mustard and pepper in the bowl. 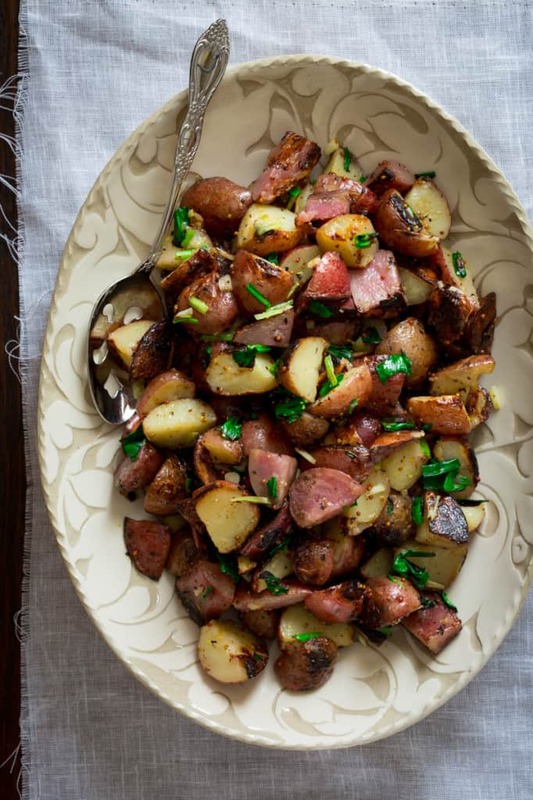 Carefully open potato packets and toss potatoes with the dressing. Allow to cool while you prepare the ramps. Brush the remaining ½ teaspoon oil over the ramps (or scallions) with a pastry brush. Grill ramps quickly turning frequently, until wilted and starting to char in spots, 2 to 4 minutes. Chop into small pieces. Add chopped ramps to salad and toss to coat. Serve warm. This looks wonderful, Katie! Pinning! Love, love, love ramps. We just got some ramps yesterday and made a simple pasta with them along with olive oil, salt, pepper, and Parmesan. What a gorgeous salad. I love this. I’m looking for ramps in our area and hope to find some soon. 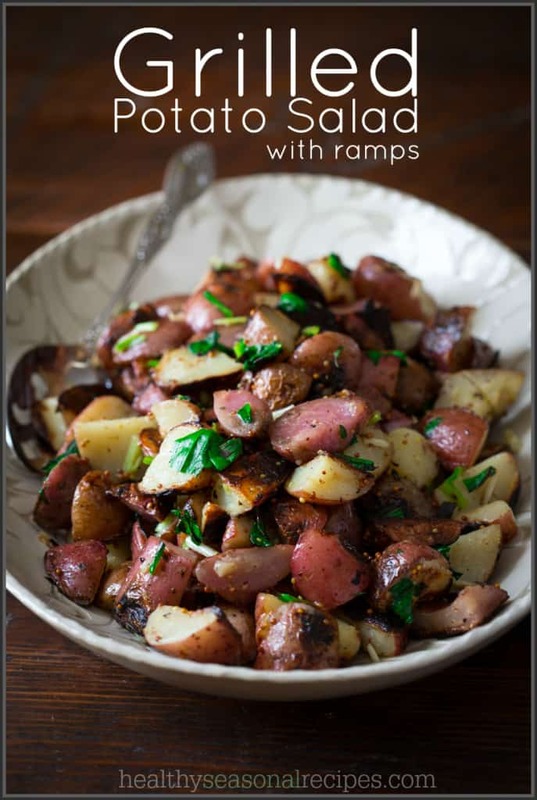 We love ramps here, what a great way to prepare them. The addition of cider vinegar is wonderful. Happy week-end to you! 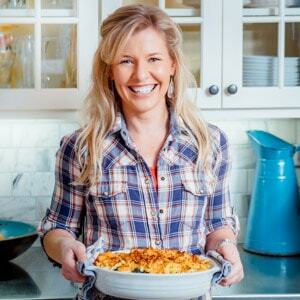 I would love to try this recipe out. Your picture of the ramps look are so beautifully green and fresh! I am hearing SO much about ramps recently – where the heck have I been?! This looks delightful Katie, pinned!